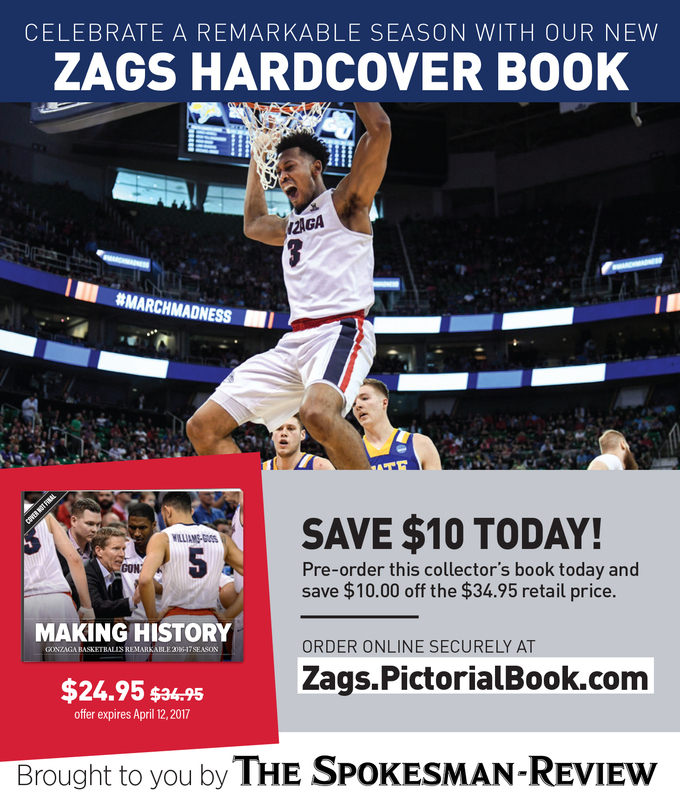 UPDATED: Mon., April 3, 2017, 10:38 p.m.
Gonzaga University could have been national champions, if only for, well, for a lot of things. Things like the Zags’ 14 turnovers. Or 27.6 percent shooting after halftime. Or the 20 second-chance points the Bulldogs gave up. Or their leaders, Nigel Williams-Goss and Przemek Karnowski, combining to shoot 6 of 25 from the floor. But the topic of conversation the day after North Carolina’s 71-65 NCAA title game victory may not have much to do with those things. Instead, it will be about a second half marred by … well, there is no easy way to put this. It was marred by awful officiating. Don’t just take our word for it. Or social media’s. Listen to the comments from CBS’ announcing crew. And remember, CBS (and Turner) are billion dollar partners with the NCAA in this endeavor, so the default position is usually to mute criticism. But Jim Nantz, Grant Hill and Bill Raftery seemed as befuddled as the viewers. “All these whistles in the first 10 minutes has made for a choppy (second) half,” Nantz said while things were still relatively staid. Soon Hill would point out there were 21 foul calls – combined – in the first 12 minutes of the half. Raftery would mention, during a review of what would become a flagrant foul on Karnowski – one the former coach thought should not have been called – that “the fans are perplexed, the players are perplexed” by all the whistles. In the end Michael Stephens, Verne Harris and Mike Eaves called 44 personals, the teams shot 52 free throws and four of the top five big guys on both teams had at least four fouls. And yet, after all that, the game may have hinged on a missed call with 49.1 seconds left. Let’s set the stage. North Carolina led by one, 66-65. The Tar Heels had the ball. Gonzaga (37-2) had a single timeout left. It needed a stop. North Carolina’s Joel Berry II, the best player on the court this night with 22 points and six assists, took a 3-pointer that missed badly. The Heels’ Kennedy Meeks got a hand on the rebound, but so did Silas Melson and Karnowski. The ball was loose on the floor. Meeks dove. Melson dove. There was a tie up. Carolina ball. There was just one problem. Meeks’ hand was out of bounds while he had the ball, something Harris rightfully noticed on a Killian Tillie play just minutes earlier. But despite what seemed an easy call, Eades didn’t see it. And even though rules allow for a replay in some late-game situations, which would have assured Gonzaga another possession down one, none occurred and the Tar Heels were given the ball. They ran the clock, Isaiah Hicks made a layup at the shot clock buzzer and, with 26 seconds left, Gonzaga was down three. After a time out, Nigel Williams-Goss missed a tough shot, UNC got a leak out and it was over. How important was the non-call? Well, Mark Few thought the play was critical. A fitting mistake in a game filled with them. And it was the Zags who made the most at the end. The Tar Heels outscored Gonzaga by 8-0 in the final 1 minute, 53 seconds. “Too many missed opportunities,” is how Raftery described it. Gonzaga fans would probably agree, but they may also point to a little exchange between Nantz and Raftery with 3 minutes left and wonder what could have been. “Here again is the foul ‘blotter,’ ” Nantz said as the both teams’ foul trouble flashed on the screen. His partners chuckled at his emphasis on the last word. “It’s like the crime scene,” Raftery said. “Feels like it,” was Nantz’ response. That feeling might be pretty common in Spokane today. Published: April 3, 2017, 9:55 p.m. Updated: April 3, 2017, 10:38 p.m.